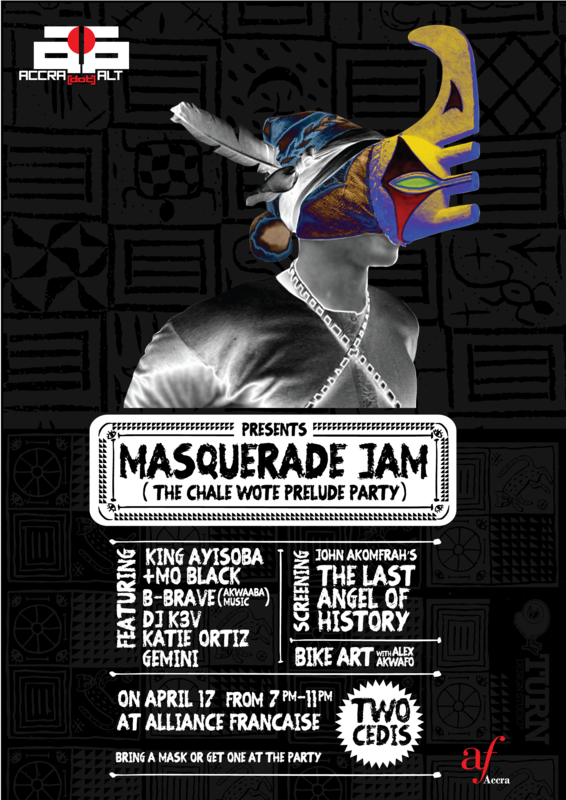 Step into Accra’s intergalactic MASQUERADE JAM on Wednesday, April17th as we prelude party our way to Chale Wote 2013 [Save the Date: September 7 + 8, 2013 in James Town]. Come and rave with bumping new music from KING AYISOBA + MO BLACK, DJ K3V [Ashesi Uni], BBRAVE from Akwaaba Music, hip hop artist GEMINI and KATIE ORTIZ [New York Uni]. Plus check out a bike art installation by legendary cyclist ALEX AKWAFO. We will also be screening Afrofuturist movie THE LAST ANGEL OF HISTORY by Ghanaian director, JOHN AKOMFRAH from 7PM-8PM. As IndieWire muses, the 1996 documentary film is an “engaging examination of the relationships between Pan-African culture, music, science fiction, intergalactic travel, and computer technology” and represents a seminal work in the field of Afro-Futurism. Bring a masquerade mask for this High Fiction jam-out or get one at the party. It’s only 2 cedis at the door.